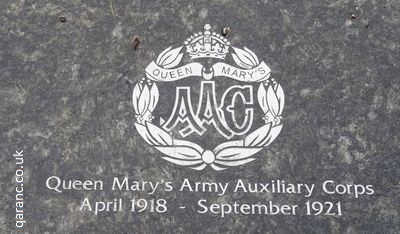 The Queen Mary's Army Auxiliary Corps was formed on 9 April 1918 with Her Majesty as Commander-in-Chief of the Corps. It was formerly named the Women's Army Auxiliary Corps which was formed in 1917 as a result of Lieutenant General H M Lawson's report of 16 January 1917. This recommended that the army employ women in France and at home to free up more men, doing non combative work, for frontline duties. Their Chief Controller was Mrs Chalmers Watson and recruiting began in March 1917. During the Great War years over 57,000 women served, including the 10,000 women employed at Royal Flying Corps air stations and transferred to the Women's Royal Air Force when they formed in April 1918. They were first sent to the front line on 31 March 1917. This was fourteen cooks and waitresses to the battlefields of France where they cooked in hospitals and camps. 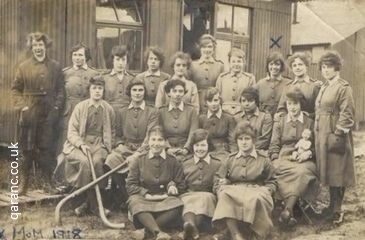 Their most senior officer was Helen Gwynne-Vaughan and Florence Leach was the controller of the cooks. As the First World War progressed they served in other countries like Belgium, Greece and Italy. 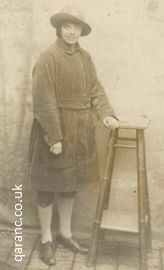 No rank was held, though they were known as officials (controllers and administrators) and members (workers) and divided into four sections of cookery, mechanical, clerical and miscellaneous and later included an auxiliary corps of the Royal Army Medical Corps to administer to their own personnel. Roles of the WAAC and QMAAC included telephonists, mechanics. Their uniform was the khaki coloured uniforms of male soldiers. They wore a small cap, jacket and skirt, which was no more than twelve inches from the ground. 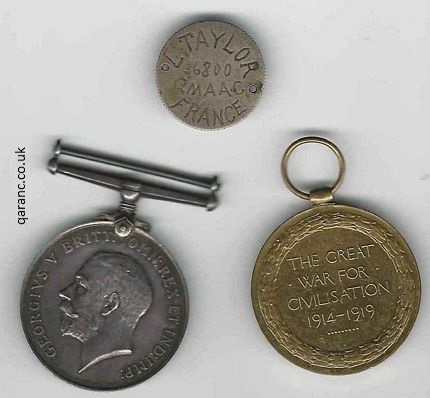 Five members of the Queen Mary's Army Auxiliary Corps were awarded the Military Medal during the Great War. Honours and Awards to Women: The Military Medal has details of these along with why they were awarded the MM. Demobilisation began upon Armistice in November 1918 and the QMAAC was no longer formally in existence on the 1 May 1920 although a small unit was attached to the Graves Registrations Commission at St Pol and was disbanded on 27 September 1921. A German air raid during World War Two saw much of their records lost, though the National Archives have now added those that did survive online. 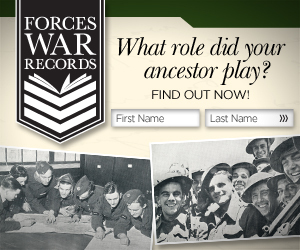 See our Service and Genealogy Records page for further details. Ivy Lillian Campany was the last WAAC veteran. She died in 2008. Their collection of historical photos and diaries were held in the Women's Royal Army Corps Museum in Guildford until this closed. They can now be found at the National Army Museum, Royal Hospital Road, Chelsea, London SW3 4HT. Below are photographs and information of their war graves. We think that 8 officials and 75 members died in service during WWI. 10515 Worker D. Quane Q.M.Army Aux. Corps 19th April 1918. See also Ellen Graham Thomson QMAAC. Above is Edith Lilly Taylor, known as Lily as she did not like the name Edith. She was born on the 9 March 1896 and served in France in the QMAAC as either a cook or waitress. In the group photograph below, she is in the back row, third from the right. Below is her dog tag which was engraved on a French coin with her identity number 36800. 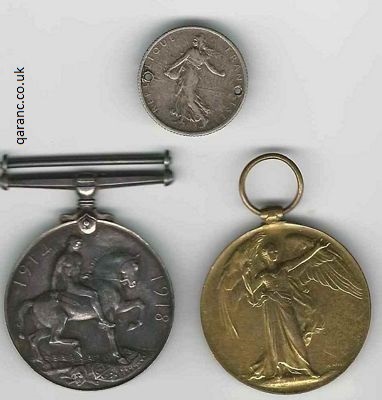 It is pictured alongside her British War Medal 1914-18 and her Allied Victory Medal, both without ribbons. Read the World War One ID Bracelet page to discover why personnel engraved their details on metal objects. Pictured is Ann Mackay from Bettyhill, Sutherland Scotland. Mackay was her maiden name and she was born in 1897. She served in France in World War One where she met her future husband in either 1917 or 1918. He was injured and had been gassed in the trenches. He went onto serve in Archangel Russia in 1919. Sadly, his records were destroyed during the Second World War. Her family would love to learn more about his grandmother and her photo, especially in identifying the uniform. We think she may have served in the Women's Army Auxiliary Corps (WAAC) which later became the Queen Mary's Army Auxiliary Corps (QMAAC). So, she may have been a nursing assistant or a cook. I think she may be wearing her ‘best uniform’ in the photo. Her white collar indicates a forewoman and not a worker. Or she could have been a clerk at the military base at Rouen or Wimereux. If you can help with further information please contact me.